Canadian pianist Carolyn Jones gave her orchestral debut at the age of 14, performing the Mendelssohn G minor Piano Concerto. Since that time, she has been active as a soloist, collaborative pianist, and chamber musician, performing in many prestigious venues across Canada, as well as in the U.S.A., Japan, Hong Kong, and Europe. She has also performed on several occasions at the Canadian Embassy in Vienna. In 1992, she was a prizewinner in the International Music Competition of Vienna. Ms. Jones' highly communicative and imaginative style, assured delicacy of touch, and clarity of voicing is frequently hailed by critics worldwide. 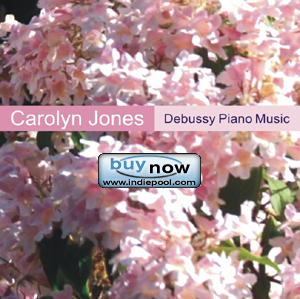 Her recording of Debussy Piano Music was released in September 2010 to critical acclaim. Her recording of Haydn Piano Music was released in September 2012 and further recordings of the music of Debussy and Ravel are planned for the fall of 2012. Highlights of the 2012-13 season include her first tour in the U.K., along with return performances in Europe and Hong Kong.